Mrs Henderson handed out her Awards for Excellence at our assembly yesterday. These are new awards that will be given out every term to one child in each class that has been showing Excellence all term. This means that they have been trying their very best every day. It was a very hard decision, but this term the award was given to Caitlin. Caitlin has been showing the Eastern Hutt values all term and has been trying her best, even when her work gets a bit tricky. Congratulations Caitlin! 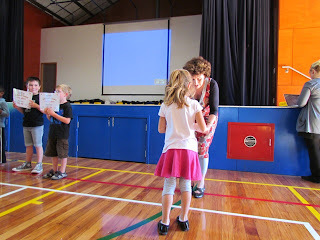 Here are some photos of Caitlin receiving her award in assembly. 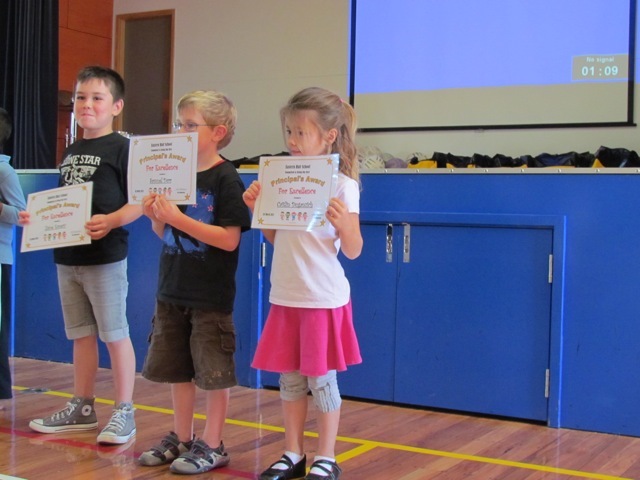 Next week all the children who received these awards will have a special morning tea with Mrs Henderson. I wonder who will get the award in B4 next term? We will all have to remember to do our best and try hard every day.